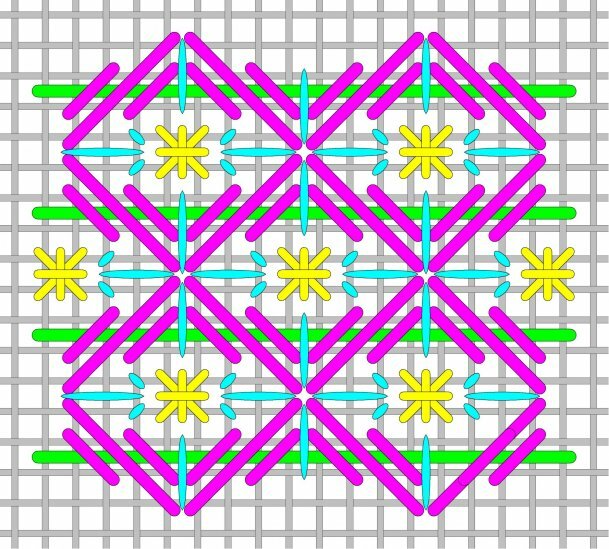 Shown in blue is an oblique cross stitch which is great to use when you need a cross stitch that slants either to the right or left. It is perfect when you are using an upright cross in the center of an area and need a matching stitch which leans towards it. 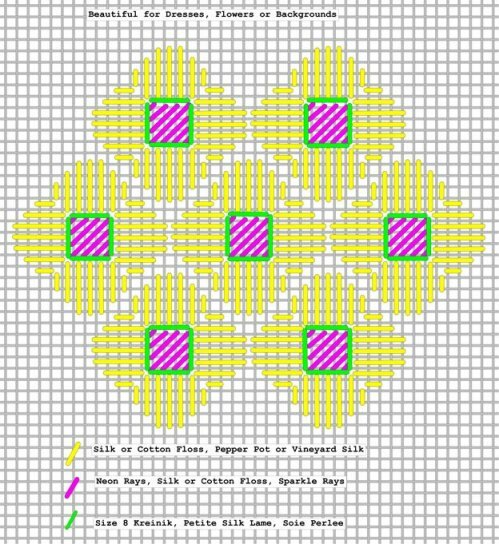 For further interest add the oblique reverse continental stitches shown in yellow. This stitch would be very effective for greenery, hills, trees, snow, sand or areas you would like to have a textured look. For bushes, you could use a strand of Watercolours, Straw Silk, Pepper Pot, Silk or Cotton Perle and many others. For snow, use Flair or Pet. Frosty Rays for the blue lines. Use this stitch for sand with a Perle cotton or silk Perle for the blue and Pet. Silk Lame' or other very lightweight metallic for the yellow. Or try a combination of 1-2 strands of silk or cotton floss blended with Accentuate for the blue lines. For a delicate look the blue lines could be stitched in a single or double stranded silk or cotton adding the oblique reverse continental stitches in a very lightweight metallic. Notice if you take away the blue lines, you are left with an oblique reverse continental stitch! Double Alternating Nobuko is a wonderful stitch. Since the stitches alternate in direction you will get a nice non-directional stitch. Non directional stitches (including Criss Cross Hungarian and Serendipity) work great in rounded areas even circular areas, but beautiful just about anywhere. For a solid look, use any single ply thread such as Pepper Pot, Vineyard Silk, Straw Silk or stranded silk or cotton floss or even Bella Lusso or Impressions for the blue diagonals and stitching all the way across with the same thread for the purple diagonals. For a different look, stitch the blue diagonals in any thread as described above then stitch a second for the purple diagonals. A metallic braid, OD metallic braid, Neon Rays or OD Shimmer Ribbon Floss by Painters Threads would be a great look for the purple diagonals. 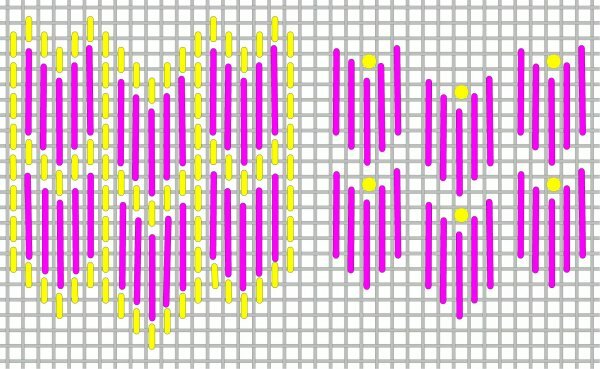 Using beads in place of the purple diagonals would make this stitch look completely different and add texture and dimension and sparkle! Lean the beading thread as shown when attaching the beads. This is a wonderful stitch pattern that works really well on clothing since you can change directions for the sleeves and dress. The pattern on the right will finish with a wider look than the pattern on the left. For a very sparkly look, choose Neon Rays, Neon Rays Plus, Shimmer Ribbon Floss or other ribbon type thread for the red stitches. The purple diagonals can be stitched in a single ply metallic braid. Shading is easy too. Or use one color for the red and an OD metallic for the purple. The red straight stitches also would look beautiful when laid carefully in silk or cotton floss, 4-5 strands for 18 mesh. The purple diagonals would look great in Silk Lame' for a more muted sparkle. For a different look altogether, use Straw Silk, or 2-s of Impressions or Bella Lusso for the red and 1-s Watercolours, Pepper Pot or OD Vineyard Silk for the purple. These patterns will also work in many other areas. The left sided pattern is a nice change for a striped look rather than traditional cashmere. 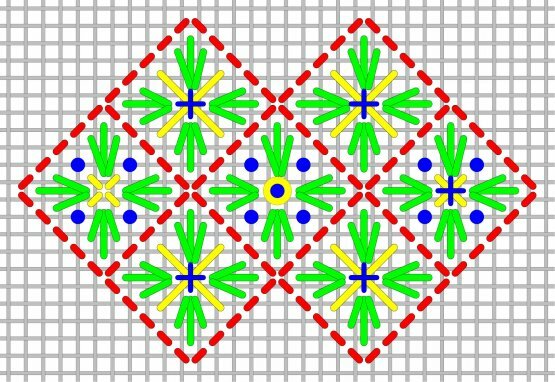 The enlarged Criss Cross Hungarian is a perfect stitch anywhere you would use the traditional Criss Cross Hungarian but in a larger area. This pattern catches the light of the silk beautifully when stitched with 3-4 strands on 18 count or 5-6 strands on 13 count of a silk that is laid smoothly. Use a sz. 8 metallic braid for the 1 x 1 crosses or attach a size 14 or 11 bead in its place. This pattern would look amazing using a very gently OD silk and a solid metallic or using a solid silk and gently OD metallic. Change the threads for a completely different appearance and texture by using a gently OD Pepper Pot Silk or its solid, a gently OD Vineyard Silk or its solid, 1 strand Watercolours or Impressions or Straw Silk for the diagonal motifs. Painters Threads OD Ribbon Floss, Neon Rays or Silk Lame could also be used for a higher sheen look. Consider stitching the traditional sized Criss Cross Hungarian pattern for sleeves, for example and the enlarged version for the robe or skirt. 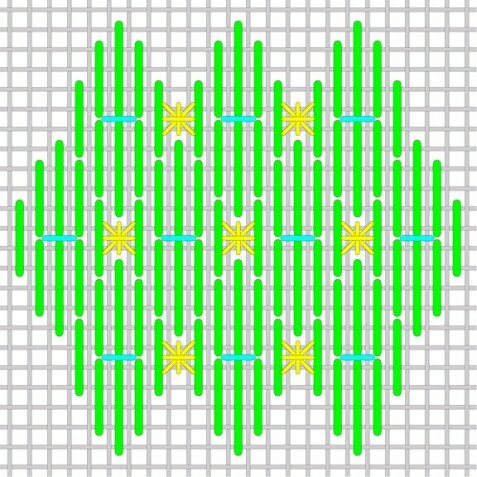 Because the diagonals are stitched in two directions this pattern works well in rounded ares, too. 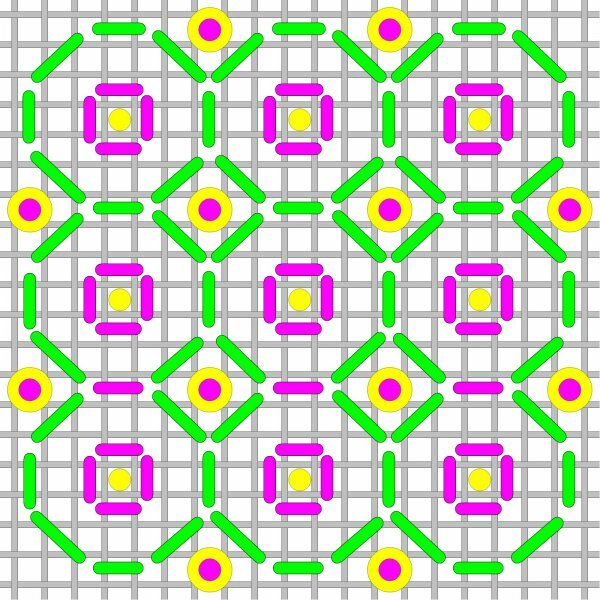 This pattern is Serendipity with the center stitches replaced with beads. For a lightweight sparkly pattern use a lightweight solid or gently OD metallic for the red stitches. The red stitches are worked horizontally as numbered. Next attach the beads working vertically or horizontally. Notice that the beads are stitched in two manners, one over a canvas intersection and the other to sit inside a canvas hole . Size 14-15 beads would work well for both but for a more textured look the beads that sit inside a canvas hole could be size 11's. In most cases, monotone colors are used. Consider using for small decorative areas of clothing, accessories like purses, packages, stars, moons and suns. The pattern works well in round or domed spaces. Change colors when you would like two colors, for example, in greenery with berries. In this case you may want to change the red stitches to 2-3 strands of a gently OD silk or cotton floss, Silk Perle or Wildflowers. There are many other OD choices and solids look beautiful, too. Choose contrasting beads. NOTE! If you don't like to bead stitch single wrapped French Knots at the green circles that lay over a canvas thread and place Colonial Knots or double wrapped French Knots where the green circles lay in the empty canvas holes. A great pattern that fits in small and medium sized areas. For the yellow lines consider a single ply thread such as Pepper Pot and for the purple, silk floss or Neon Rays. Choose coordinating thread colors unless you want a multi colored look. A solid colored thread for the yellow and Painter's Threads OD Shimmer Ribbon Floss for the purple would be beautiful. Choose similarly colored or accent beads for the green. To work this pattern thread one needle with the thread chosen for the yellow and thread another needle with the thread for the purple lines. Working in diagonal rows stitch the yellow lines and then the purple lines. Repeat yellow then purple. Attach the beads. Use both directions in the diagram when you want your stitches to lean to the center or in opposite directions. For example, on a robe, dress or coat with two sides, pants etc. A great pattern for a number of areas. For clothing choose any type of thread for the yellow on the right side. 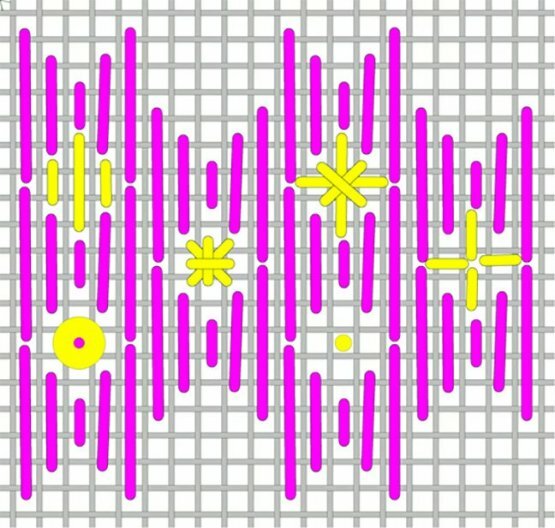 A beautiful folding effect will be created if some yellow stitches are shaded. Stitch the purple tent stitches in a lightweight metallic or add beads over the purple circles. Or leave un-stitched to allow the painted canvas to show. 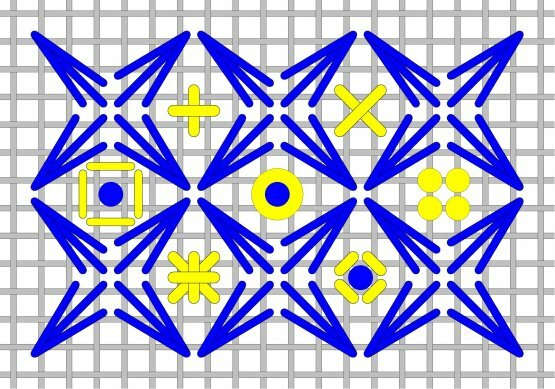 This pattern also works very well for drapery, shutters, water, mountains, buildings and roofs. Choose the left sided portion of the diagram in blues and greens for a column effect that would be great for wallpaper, walls or where columns are desired. Add the darker colored tent stitches in a contrasting or coordinating metallic or different thread type. Triple Nobuko is a great overall pattern to apply in many areas. 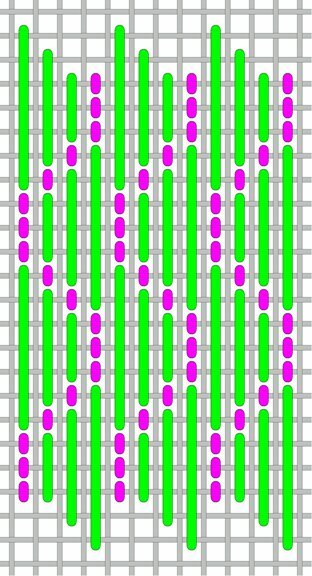 Traditionally the same thread is used as shown in the horizontal row labeled 1. This is especially effective in silk floss but virtually any thread can be used. 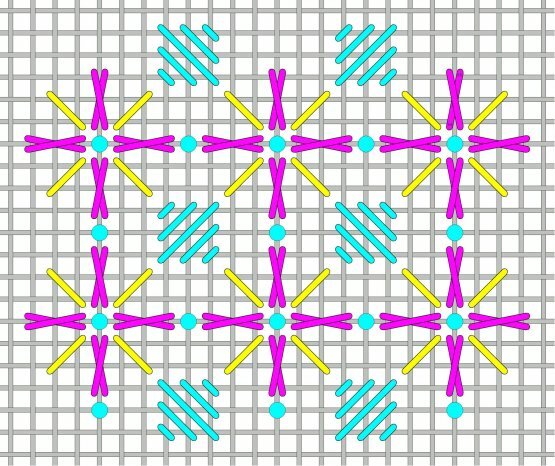 A variation of the stitch pattern includes changing the center tent stitches to a new thread or color, shown in the horizontal row labeled 2. Again any number of threads can be used for the green diagonals and a medium weight metallic could be used for the purple stitches. Another variation, row 3, would be to attach sz. 14-15 beads in place of the center tent stitches. 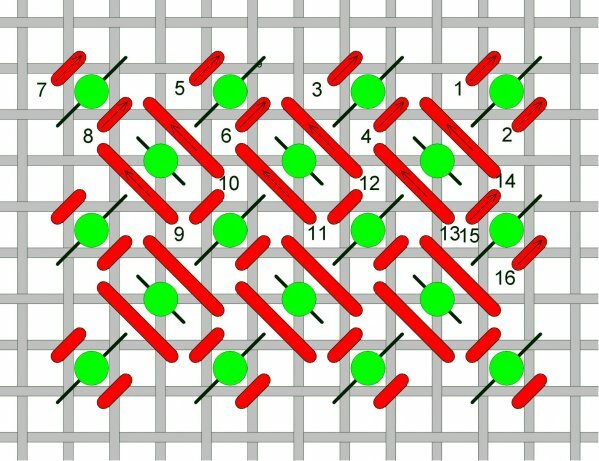 In variation row 4 a larger bead is used in the center tent stitch. This would be nice in a size 11 bead or 1.5-2 mm glass pearl. 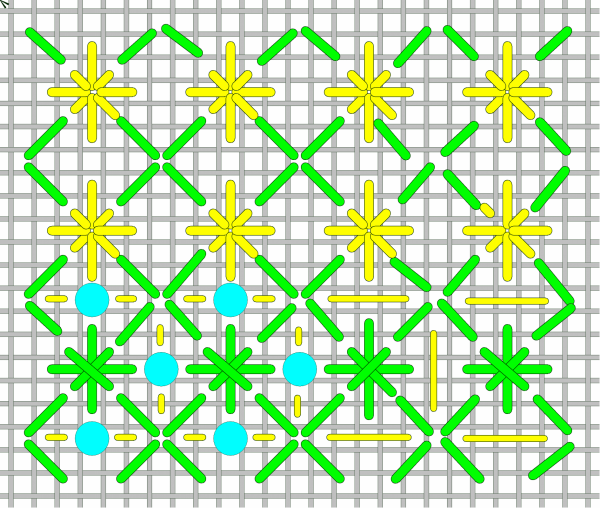 In variation row 5, a cross stitch is stitched in the center. A lightweight metallic such as a #4 regular or OD Kreinik would work well. The last variation, row 6 would be to leave all the center tent stitches blank for an open look. 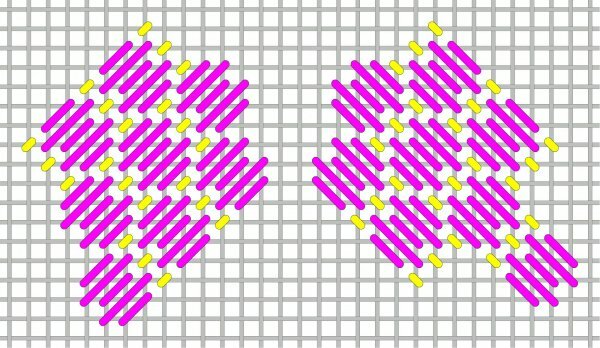 Using the pattern shown on the left, use silk floss for the purple and a shiny flat ribbon for the yellow such as Neon Rays or Painters Threads Shimmer Ribbon Floss. Or reverse that using the shiny ribbon for the purple. Consider these threads for pillows and fabric on furniture and more. Choose two threads from Floche, silk floss or Sz. 8 Perle Cotton for curtains or wallpaper. Use two similar shades of metallic ribbon such as Fyre Werks or 1/16" Kreinik for wings, a mermaids tail or fish for the two diagrammed colors. Change the purple to Straw Silk or Sea Grass with 2 strands Impressions or Wildflowers for the yellow for an altogether different look. The pattern on the right is a modified version and would be great for backgrounds. Skies can be stitched with a lightweight metallic such as Pet. Silk Lame', Sz. 4 Threadwork metallic or 2-s Accentuate adding a sz. 14-15 bead for the yellow circle. Change to sz. 11 bead if heavier weight threads are used. The pattern has an arrow or heart shaped look so it works great in areas with those themes. NOTE: Stitch many of the above suggestions horizontally. Turn the diagram 1/4 turn to do so. The vertical crossed laid foundation pattern shown on left is great as a background for stand-ups or pieces that have a greater height than width. Choose a monotone look for a subtle background especially for those with flowers using a very light metallic for the long vertical greens, such as a sz. 4 metallic or OD metallic, for the first step in green and a single strand of silk floss for the purple as the 2nd step. For a less metallic look, use #8 Cotton Perle or Silk Perle for the green stitches and 1 to 2-s Sampler Threads, OD Cotton, Gloriana, Needle Work Silk or other strandable threads for the purple. For patriotic or other holiday pieces the two colors could be changed dramatically. NOTE: Make sure to work the purple stitches vertically in the same sequence to prevent different weight threads or different colored threads from showing on the front. 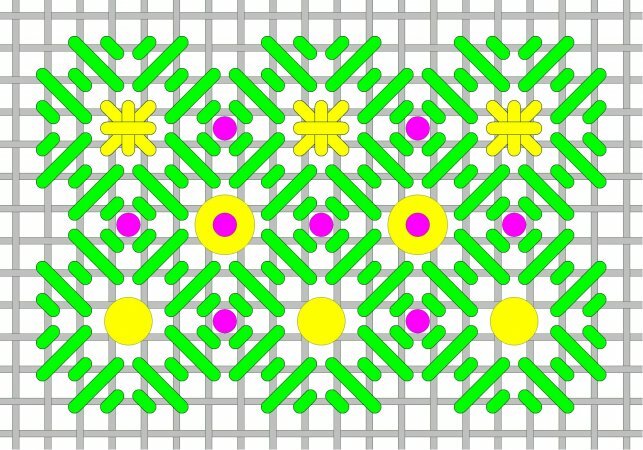 Turn the pattern horizontally as shown on the right, and change the thread weight to stitch for bushes, grasses, baskets and in some areas for clothing such as skirts. 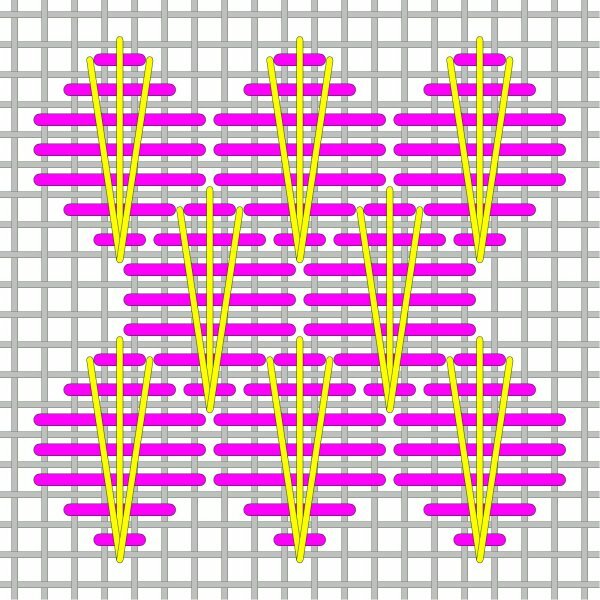 For this direction, stitch the purple stitches horizontally in same sequence. 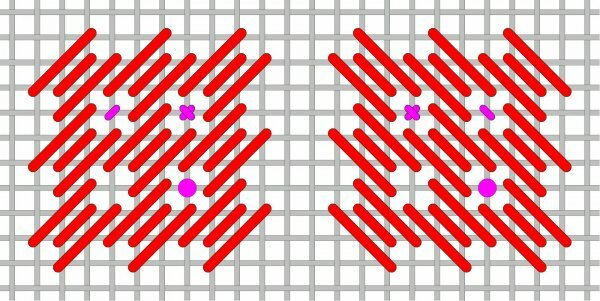 This stitch can be used as shown on left for most vertical spaces. For backgrounds with hills or mountains follow green stitches using two strands of silk floss or one strand of Impressions, Floche or Sz. 8 Silk or Cotton Perle. Increase the weight of the thread to work for tall trees and and topiary if they are on front part of design using more strands of silk floss, Vineyard Silk Classic or a ribbon such as Straw Silk. 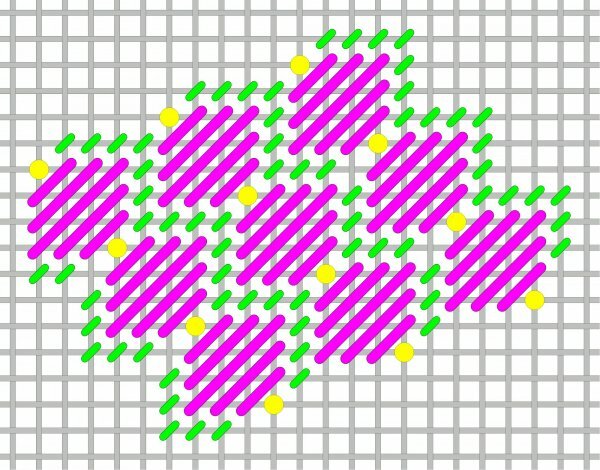 Turn canvas to work stitches vertically. Add a metallic or contrasting thread for the yellow. 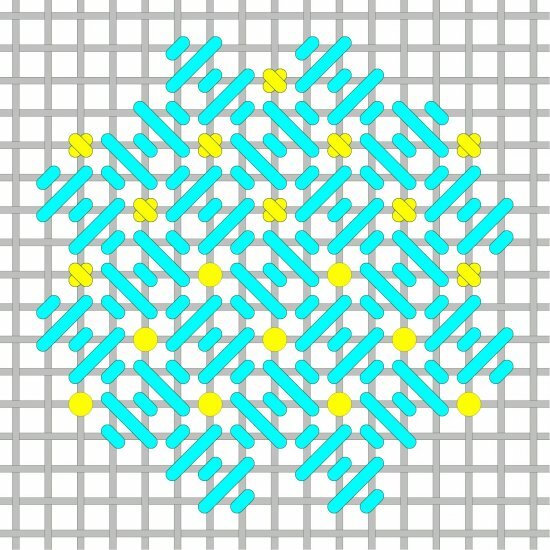 Reverse the direction and work the blue stitches for sky or water using similar threads used for the background. Either pattern will work for clothing, drapes, tablecloths, wallpaper and more. 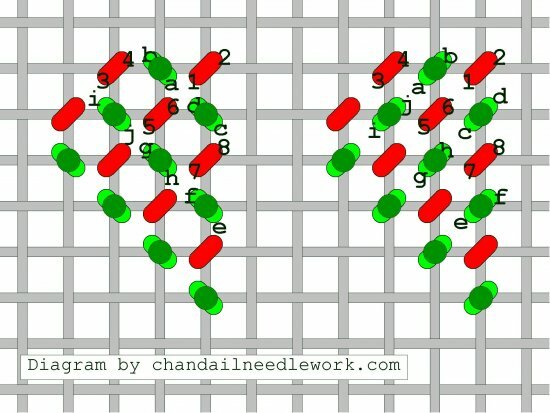 for the mosaic stitch which is the most commonly used center motif for this pattern. Use the same type of threads for the single diagonal stitch. Change the thread for the green stitches to a single ply thread such as Vineyard Silk Classic, OD Vineyard by Threadworx, Pepper Pot, or Petite Very Velvet or Peluche with a metallic, ribbon or another single ply thread for the center motif for a completely different look. A size 11 bead or 2.8 mm drop bead could be used for the single yellow dot. A sequin with a bead on top could also be used as shown with the yellow and green dot. 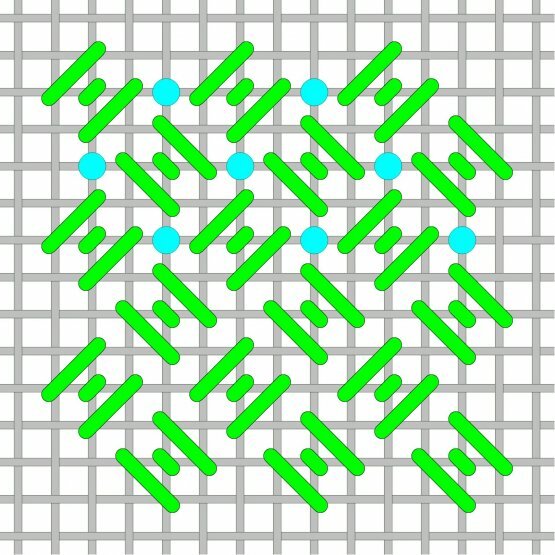 Four beads could be placed over each canvas intersection. A small bugle bead could be used as shown with the vertical yellow stitch which could also be stitched diagonally. With it's gentle slope it is great for movement in clothing, backgrounds, snow and many other areas. 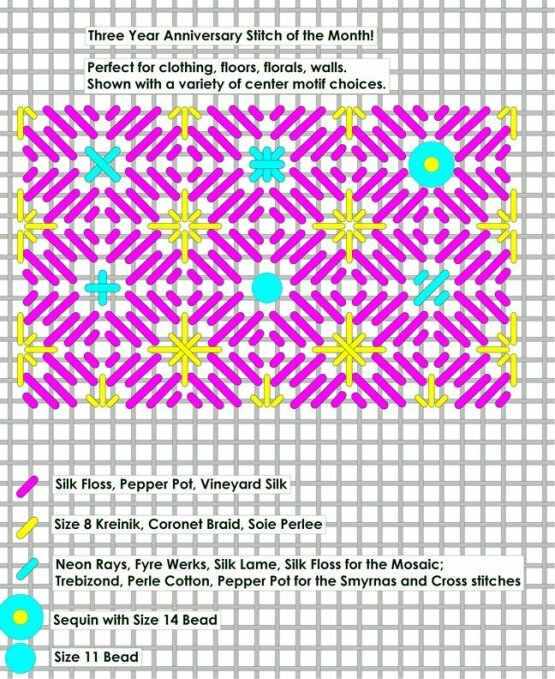 Use stranded silk for the pink and a metallic for the dark aqua tent stitches. Change the look with a single ply thread such as Watercolours, Pepper Pot, Vineyard Silk Classic or Straw Silk for the pink and a bead or shiny metallic for the dark aqua. This pattern works great for clothing, especially jackets, sleeves, or a robe for Santa since it can be stitched in two directions (mirror image pattern for the opposite side). Turn the diagram 1/4 turn in either direction based on need and it will work for a sky, water or snow. Choose a very light weight thread such Petite Silk Lame, Soie Perlee, Sz. 4 or 8 metallic, or 2 strands of silk floss for the pink for a sky or water. Ignore the 5 tent stitches or beads if you would like a more open look. A gorgeous pattern that works beautifully on dresses and robes. It is great for wings too. 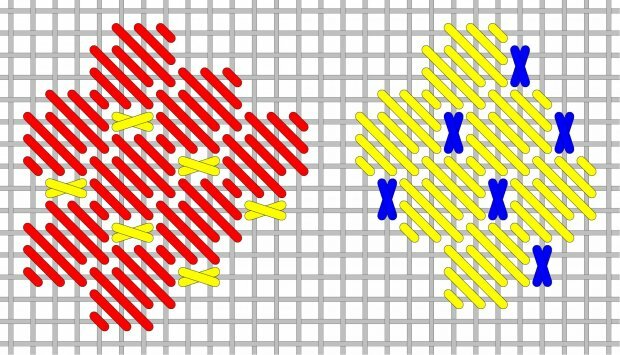 This pattern works best in medium to larger areas. Consider using a strandable silk for the blue, Neon Rays or another flat ribbon for the yellow and a metallic for the pink. Another great small stitch that works well when a mirror image of a pattern is desired. Perfect for clothing especially pants, coats, shoes, mittens but it could also be used for roofs or snow. 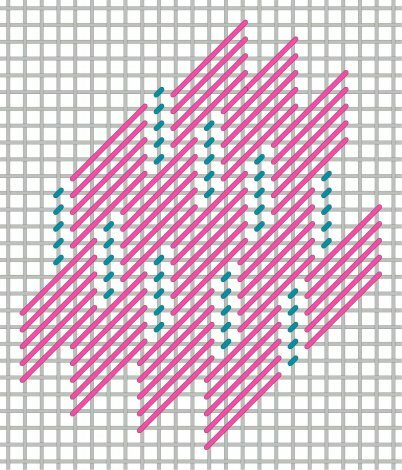 Choose to add a tent stitch, cross stitch or bead as shown in pink. Or leave that canvas intersection open. Use a silk floss for the red lines and a size 4 or 8 metallic thread for the cross stitches or a metallic ribbon for the tent stitches. For a different look consider Poppies, Impressions, Pepper Pot or Vineyard Silk for the red. 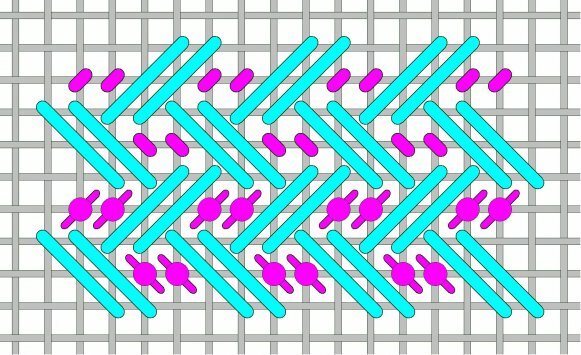 The Trellis Variation Stitch can be used in many areas such as clothing, architecture, baskets and topiary. It makes for a subtle woven pattern and depending on thread and embellishment used it's appearance will vary tremendously. For baskets or rustic areas try using Straw Silk for the yellow and a linen for the purple lines. Add a single stranded wool for the upright crosses such as Impression or Bella Lusso. For decorative items choose a ribbon such as Painter's Threads OD Shimmer Ribbon for the yellow, a metallic for the purple and a sequin and bead for the yellow and purple circles. For topiary, consider Boucle for the yellow, Pepper Pot or Vineyard for the purple and a coordinating colored bead for the purple circles. Extra Holiday Stitch of the Month! 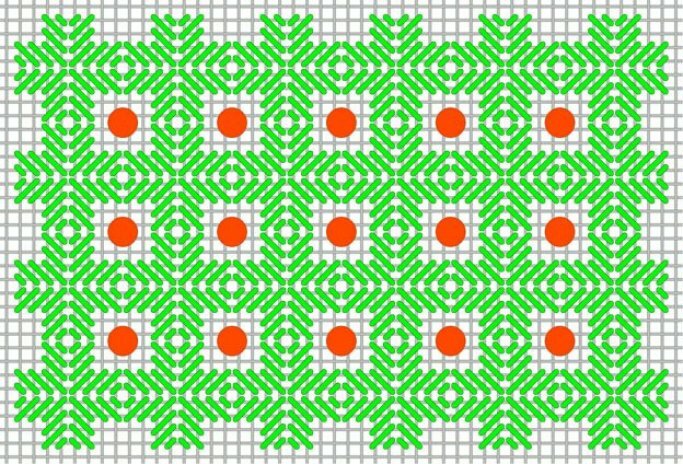 This pattern works well as a background stitch for Christmas pieces. Stitch the green horizontal stitches as if darning. Next attach beads with Invisible thread, shown as red dots. Example thread choices for the green would be a very lightweight green metallic or 2 strands of silk floss or 1 strand of Floche. Choose a red bead for the bead. For a more elegant look choose a gold metallic for the green horizontals and use a complimentary color for the bead. Chandail's Dec. 2017 Stitch of the Month is a Skip Tent and Skip Bead Pattern shown with two methods of bead attachment. 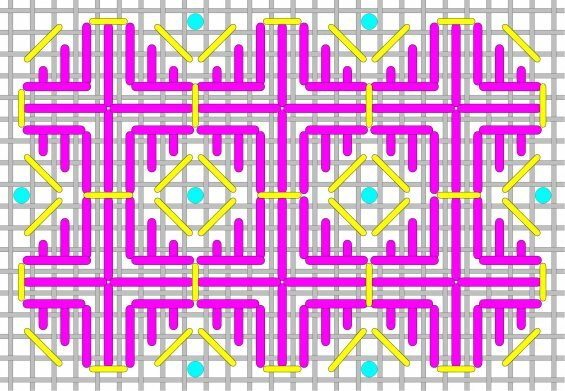 Following either diagram, begin by skip tenting following the ted numeric stitches. A lightweight thread such as size 8 Kreinik or Petite Silk Lame or even stranded solid or OD silk or cotton floss can be used for the red stitches. Next, with a colored beading thread, 2 strands of silk or cotton floss, or Invisible thread attach the first bead by bringing the thread forward at "a", stringing on a bead and plunging at "b". 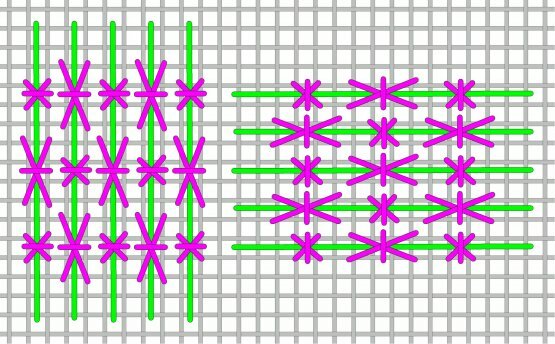 You have the choice of continuing to attach the beads as with diagonal back stitching (shown on left) or with diagonal tent stitching (shown on right). These rows of beads will be placed in between the skip tent rows. Try both ways to see how the beads sit! This is a wonderful pattern to use on halos, wings, ornaments, glass, water or any other area where you would like some sparkle, shine or translucency. This pattern is excellent in areas that require a gentle diagonal look and works in smaller areas. Even though it is on the true diagonal the look is softened by it's staggered pattern and extra tent stitches. Try it on wings, dresses, water and snow. It would also work well for a pathway or road. Use a solid silk floss or an OD silk or cotton floss for the purple for a smooth look. Watercolours, Wildflowers, Floche, Pepper Pot or Classic Silk Vineyard would give an altogether different texture. Choose a contrasting color or metallic for the yellow. A bead could be used here also or it can be left un-stitched for the painting to show. This modified swirl stitch is perfect for skies, water, snow, roof tops and more. 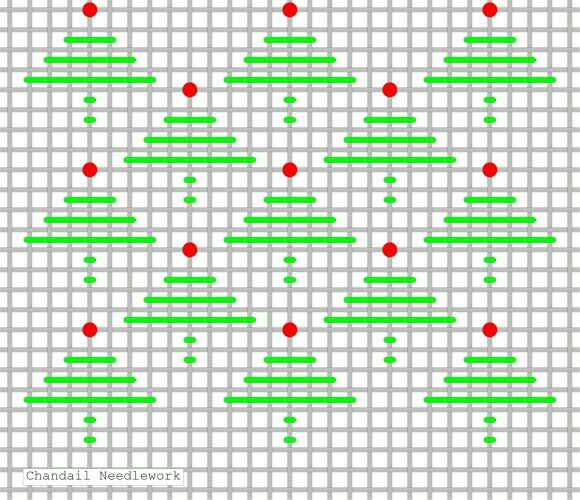 Turn the diagram 1/4 turn for a vertical look and use for Santa's robes or other long vertical clothing where a sense of movement is desired. Stitch the other side of the robe by using the mirror image of the pattern. The diagram shows two colors for ease in reading only. Generally you will want to use only one color of silk floss for the green and yellow lines (unless shading). But, a metallic can be used for the over 2 lines for added interest. Petite Frosty Rays or Flair would be beautiful for a shiny sky, water or snow. Consider stitching in a fine weight metallic or with less strands of silk floss for a lighter look or for an area that should appear in the back. This pattern works well for walkways and cobble stones, too. Another great little stitch! Use in small areas where you want to showcase the painted canvas. A lightweight metallic would work well for the green stitches for a background or water. Try Pepper Pot or a strandable silk floss for the green stitches for bushes, hills and even clothing. 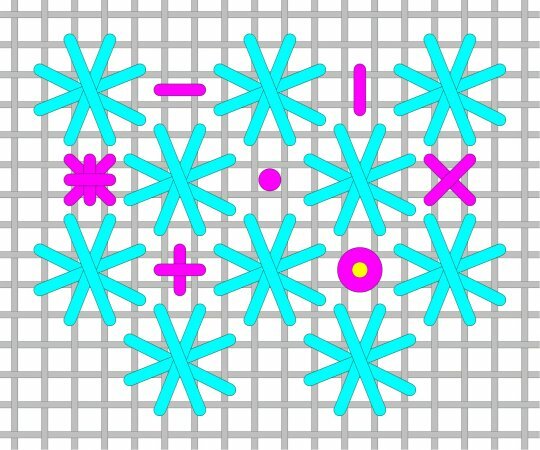 Attach beads if desired as shown with blue circles (or stitch 1x1 crosses there). Or leave open! The Mosaic Flower is a big impact pattern that can be used in small areas. Use it to stitch beautiful clothing, backgrounds, skies, water. The green works well with a silk floss but any single ply thread will also work, such as Pepper Pot or Neon Rays. Use a metallic or thin ribbon such as Petite Sparkle Rays for Smyrnas or for interest add a sequin attached with bead in it's place. You could also exchange a size 11 bead for the Smyrna or sequin. Add a size 15 bead as shown with pink if desired. A great small stitch that works really well in rounded areas and can be easily shaded. Use any variety of threads for the mosaics; silk floss, OD cotton floss, Neon Rays or Pepper Pot are just a few examples. Use a lighter weight thread for the mini cross stitches or a metallic for sparkle. Or even better, use a bead! 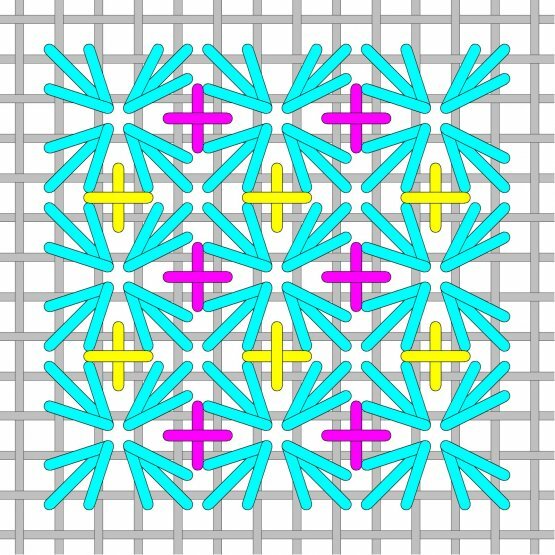 The star pattern can be used in multiple ways. Stitch for fabric, skies, snow or even bumpy animal skin. For a sky a very lightweight metallic or Petite Silk Lame would be beautiful leaving spaces in between each star. To add a direction stitch either the horizontal or vertical lines between the stars. 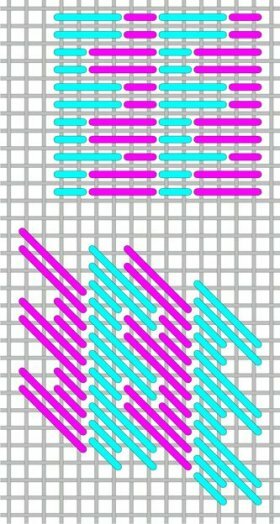 Stitch both the horizontal and vertical lines for a different effect. Use 2-s of a silk floss for the stars to use on fabric and a metallic for the Smyrnas. Or use Pepper Pot or Perle Cotton for the stars and a bead to form a raised and bumpy look. 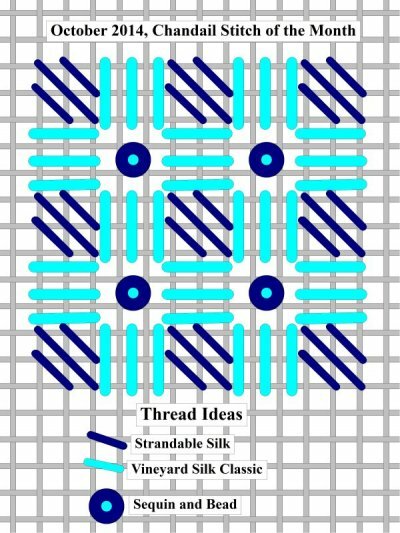 Any thread choice would have a different appearance by changing the over 2 stitch or Smyrna with a simple upright or 2x2 cross, a size 11 bead or pearl or a sequin attached with a bead as shown. A nice alternative to Criss Cross Hungarian. The Beetle Stitch is a wonderful stitch that is perfect for an area that needs a rounded look. It also makes wonderful wings and fish scales (when turned). To make the silk floss shine, make sure to to work the stitches vertically and use your laying tool!. Choose a very light weight metallic for the yellow. For an altogether different look, choose a single ply thread such as Pepper Pot, Impressions, one strand of Watercolours, Neon Rays etc. for the purple lines and a very light weight cotton or silk perle or lightweight metallic such as petite Silk Lame for the yellow lines. 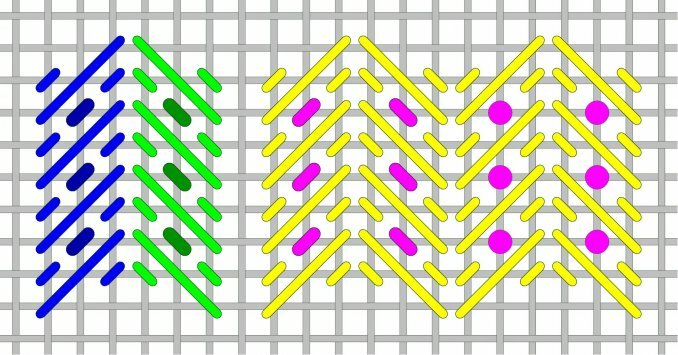 Turn canvas or diagram 1/4 turn for a directional change and use for beautiful clothing in silks for the purple, beads for the yellow dots and a metallic for the green. Landscapes in this pattern would be fantastic in Impressions or Pepper Pot for the purple and a soft metallic such as Petite Silk Lame or silk floss for the green. The bead could be ignored in this case and a tent stitch in a different fiber or color could be used to replace it, or leave it unstitched to allow the painting to show through! A great stitch for backgrounds using silk floss or a size 8 perle cotton or Trebizond. Use a metallic for the Smyrnas or consider using a sequin and bead or a size 11 bead or pearl in place of the Smyrnas. 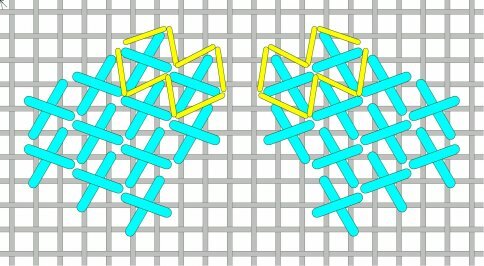 This pattern would also work well for clothing, roofs, snow and many other places! 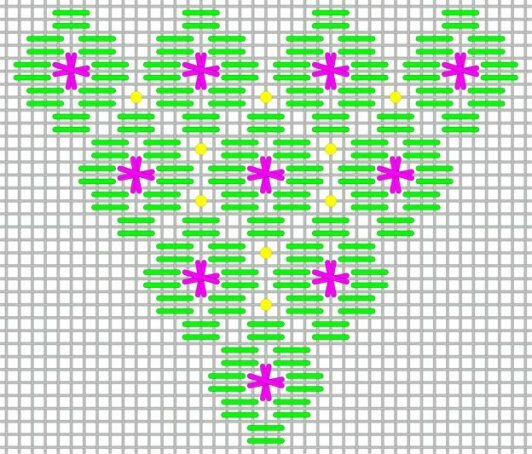 The open pattern diagrammed on the top area of this stitch pattern would make a beautiful sky especially with a very lightweight metallic or single or double strand of silk. Because of it's sheerness it would also work for areas where the painted shading would show through such as in fabrics like curtains and tablecloths and some clothing. 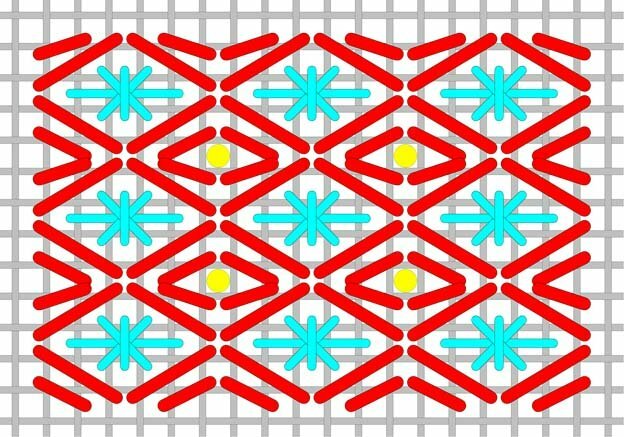 To add weight to the pattern include beads or sequins where the blue dots are shown or long straight stitches shown with vertical and horizontal yellow lines. A pattern perfect for coats, backgrounds, mountains and sky that offers a number of center motif choices. Use silk floss for the pink and a ribbon such as a 1/16" Kreinik ribbon or Neon Rays for the over 2,4,2 vertical yellow motif. Use Neon Rays or silk floss for the pink and a lightweight metallic for the cross stitched and eyelet center motifs. Or use a single size 11 bead in the center or a sequin with a bead. Another option for a heavier look would be to use a single stranded thread such as Vineyard Silk Classic or Watercolours for the pink and a coordinating thread or bead choice for the center motifs. December's pattern works well with a silk floss for the red and a lightweight metallic for the green. A great small bargello pattern for clothing, rooftops, sky and water. 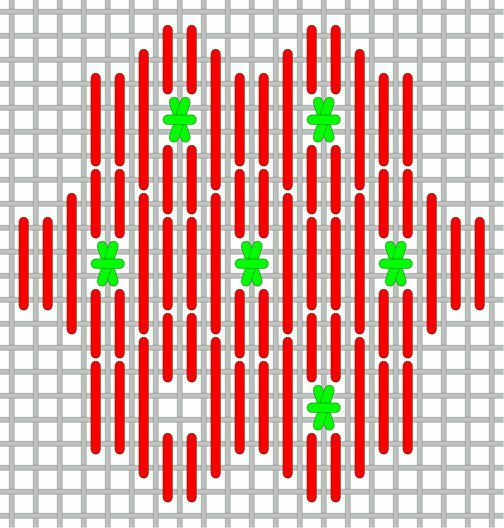 Consider replacing the green tied cross with two beads or leaving it blank as shown. The Beaty pattern can be worked in two ways as shown. This pattern works beautifully on anything needed for a vertical look. Or turn the pattern 1/4 turn and work the stitches horizontally for a wonderful roof, ground or snow pattern. The diagonal version and it's mirror image work well for clothing. Choose one silk for the pattern shown in two colors for diagramming purposes only. However; two colors of silk or two different threads could be used depending on desired effect. Perfect for a coat or background. Substitute the sequin with a Smyrna or an eyelet or mosaic for a different look. Or just fill squares with diagonal stitches for a less open look using a different floss color. Use one color silk floss for the green and the light play will make it look like two! A great stitch for clothing and areas that need a beautiful sheen! Use the same color for the red and the purple with 3 to 4 strands of a silk floss or Pepper Pot or Vineyard Classic. Add Smyrna crosses in a size 8 weight metallic. For a checkered look use two colors for the red and purple. Don't forget to use a laying tool with stranded silk. This stitch will work in rounded areas, as well. Consider using sequins attached with a bead instead of the Smyrnas. A great pattern with gentle movement. Perfect for clothing or turn so pattern runs horizontally for water, sky or a background. Use silk floss for the green lines and a medium weight metallic for the pink stitches. Suggestion: Ply up on silk floss whenever stitching straight stitches for better coverage. Consider this stitch for mountains, greenery, roofs, houses even clothing. Turn diagram so it lays horizontally for sky, water or snow. 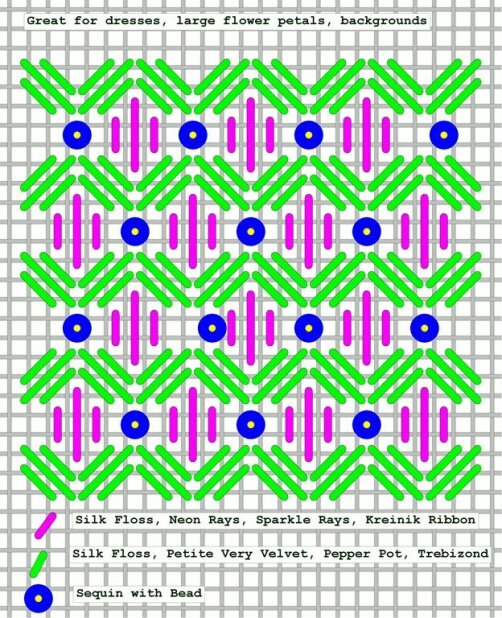 Use silk floss for the green and a Kreinik size 8 or 12 for the blue. Use a size 4 metallic or Petite Silk Lame for the Smyrnas. 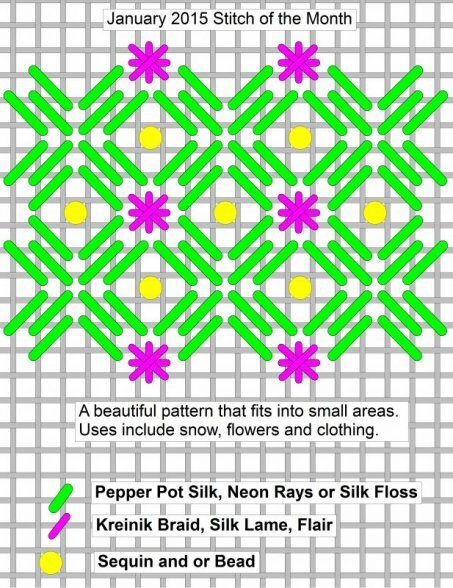 A fantastic pattern when silk floss is used for the diagonal stitches. The change in direction develops a two toned look even if the blue and purple diagonals are stitched in the same color. Stitch the yellow dots as tent stitches with a metallic thread or attach beads. A beautiful pattern for a sky, water, snow, backgrounds and clothing. Consider using 2 strands silk floss or size 8 Perle Cotton for the green, a size 4 metallic for the pink and a size 14 bead for the yellow dots (or leave unstitched). Turn pattern for a horizontal look. Two patterns that are virtually the same (please note differences) that can be used together or separately to allow for a horizontal or vertical look with a diagonal flow. Both can be mirror imaged. On the left side in red or the right side in yellow, choose a silk floss, Neon Rays, Trebizond, or Silk Lame. 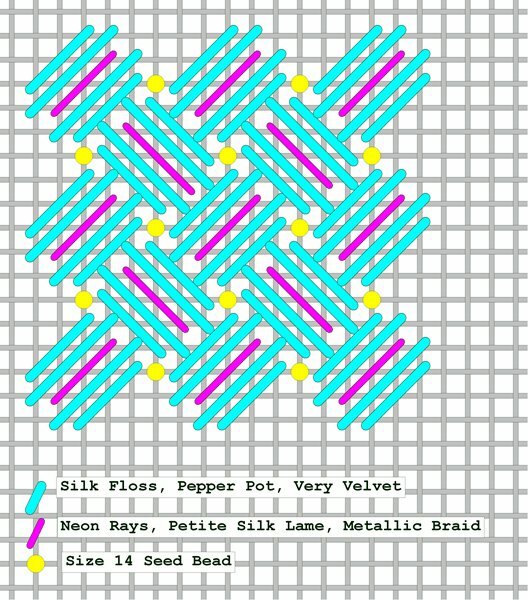 Choose a metallic for the yellow and blue cross stitches. Alternatively, replace cross stitches with two beads. Wonderful for clothing and backgrounds or those areas requiring a diagonal pattern. 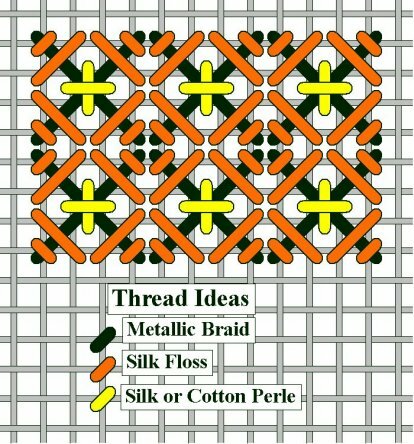 Start with horizontal foundation stitches using a size 12 metallic shown in green. Next follow the pink using a silk floss, over dyed cotton floss or Trebizond. Use a size 8 weight metallic, silk or perle cotton or Neon Rays for the yellow or replace the Smyrna cross with 4-5 beads or a sequin attached with a bead. Lastly, use a very light weight thread for the blue such as a size 4 metallic, 2 strands Accentuate or Petite Silk Lame. 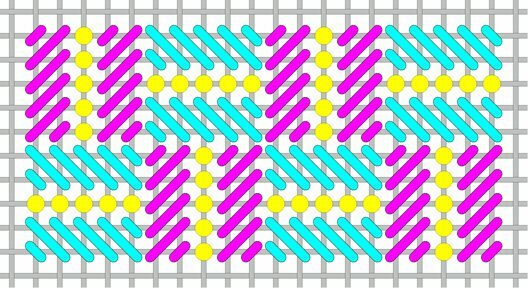 The single blue tent stitch could be replaced with a bead. Use 3 strands of silk floss, Trebizond or Silk Lame for a heavier look for the red or use a size 8 cotton or silk perle for a lighter weight appearance. Use a size 8 metallic for the blue stitches and beads or French Knots for the yellow circles. Another option would be to place sequins attached with a bead in place of the blue. Turn diagram 1/4 turn for a vertical look. January 2016 Stitch of the Month! Use Silk or Cotton Floss for the blue adding a lightweight size 8 metallic for the pink crosses and a cotton or silk perle for the yellow crosses. Or use a size 8 metallic for the blue, petite sparkle rays for the pink crosses and petite silk lame for the yellow crosses. A lightweight silk or perle cotton would work well also for the blue.